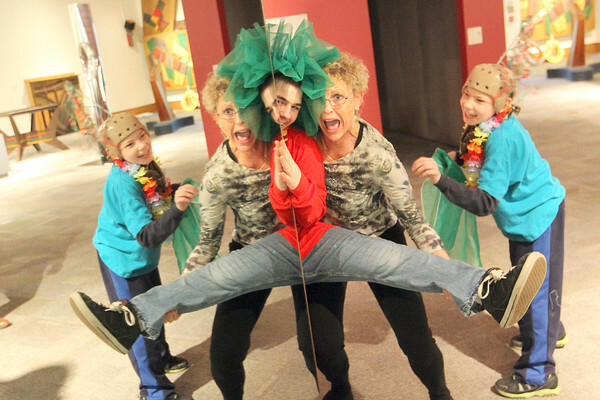 Dennis Kendall (cq) and dance therapist Kat Brown (cq) have fun with their reflections in a mirror while James Wittkop (cq) watches during Thursday's ACT - Grand Traverse "Revibing (cq) the Arts Festival at the Dennos Museum Center. The two-day festival offers workshops in dance visual art, drama and music to over 200 general education students and students with disabilities from seven schools in the Traverse City Area Public Schools and Traverse Bay Area Intermediate School District. The mission of ACT (Artists Creating Together) - Grand Traverse is to bring the arts and cultural programs to those with disabilities.